covers about 16,000 acres of land, of which about 4,000 acres are protected wetlands." I tried to find a similar description on the official Naval Submarine Base Kings Bay website but came up short on a nice little summary . . . so I'm resorting to Wiki again. We know how to pick a safe RV park, don't we? Nuclear subs. Oh, my. We're either very safe or we're risking this being a prime target of our enemies. 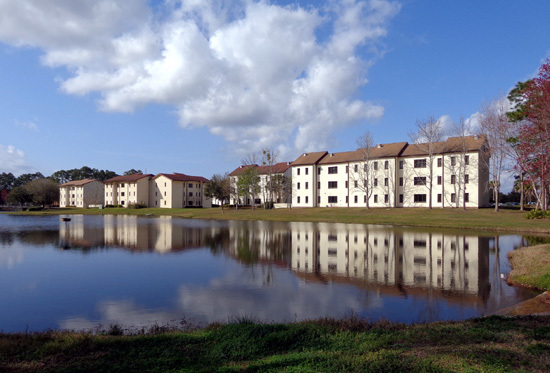 We accept that risk every time we stay at a military installation but FamCamps are some of our favorite places to camp. 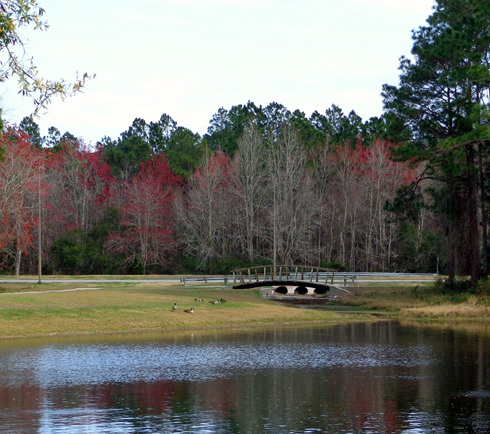 location of Eagle Hammock RV Park by Lake D with a red dot. 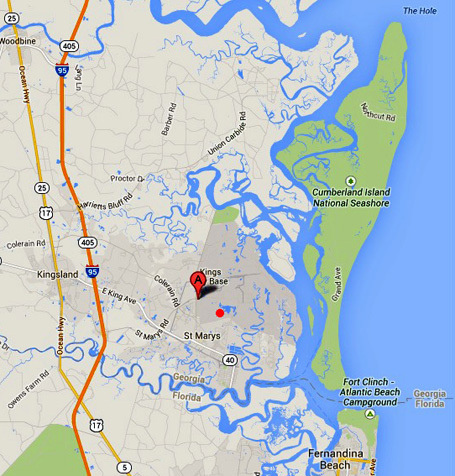 In the last entry I described the most excellent RV park at Kings Bay called Eagle Hammock. 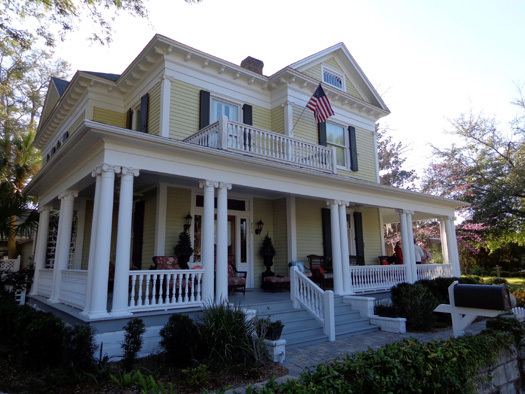 In this entry I'll show photos of more of the base that I've taken on hikes and bike rides. Although the base is large we don't have access to the eastern half of it where the subs are kept. 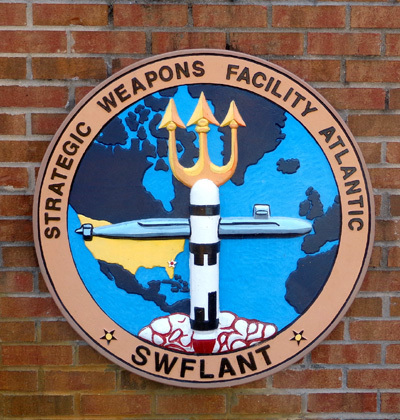 The submarines are in a second secured part of the base where even military retirees aren't allowed. Everyone needs proper ID to get in the Franklin or Stimson gates; only authorized personnel have the proper ID to reach the area where the subs are kept. 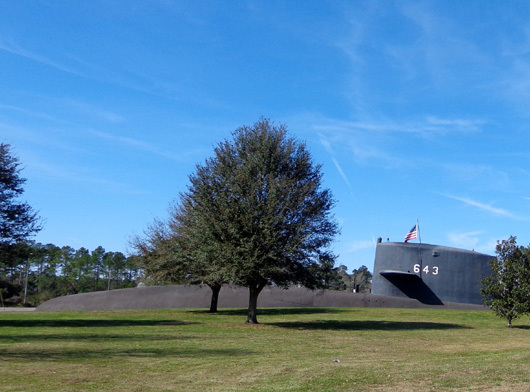 That's the USS George Bancroft, put on display in 2000 to commemorate the U.S. submarine forces' 100th anniversary. Jim saw that SUV at the commissary and took a picture with his cell phone. 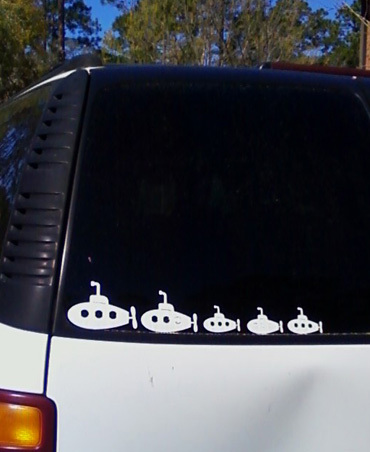 Little subs indicate dad, mom, and three kids instead of the usual stick human figures you see. Jim has been officially informed that his entry was accepted for the Leadville Trail 100-mile bike ride in August. The odds of getting into the race through the lottery were very low but proof of his many years of volunteering at the bike race paid off. LT100 is a tough, tough race on dirt and paved roads and trails at altitudes ranging from 9,200 to 12,600 feet in the Collegiate Mountain Range west of Leadville, Colorado. 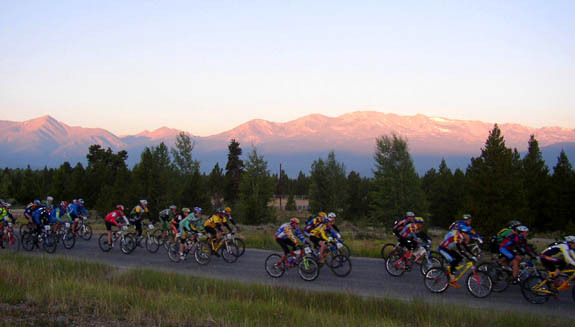 Riders in the 2004 LT100 bike race leave the town of Leadville and head toward the mountains. 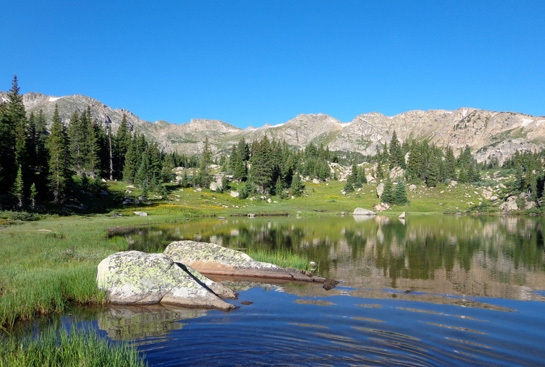 Mounts Elbert and Massive are in the background; they are Colorado's highest 14ers. We know the terrain because we've run and/or volunteered at the 100-mile foot race many times since 1998 and worked the bike race most years (it's a week before the foot race). Now Jim has a definite focus for his training and the hard work really begins. 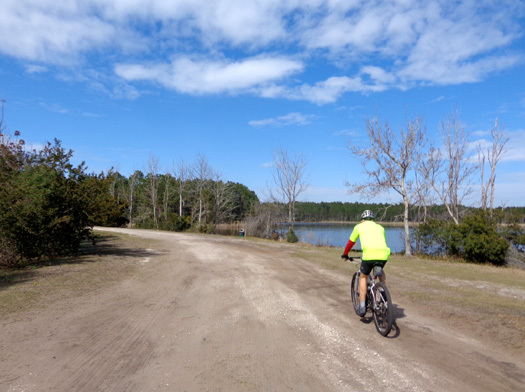 Jim starts out on a bike ride from our campground at Kings Bay; Lake D is on the right. Even though the terrain is flat and near sea level here in coastal South Georgia, Jim's been building up his cycling mileage for several weeks. With all the nearby paved and dirt roads on and off base he's done several 40-50 mile rides already and numerous shorter rides on his "rest" days. 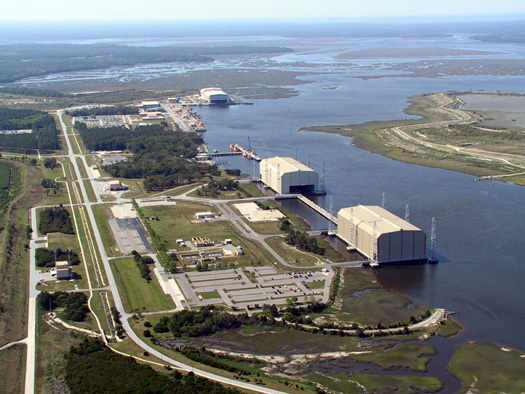 Jim has more good places to ride here on base than he did at Mayport Naval Station -- Kings Bay simply has more miles of bike paths and roadways. 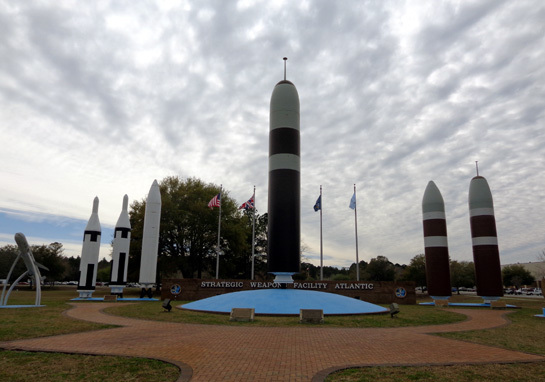 Above and below: the Strategic Weapons Facility is located about 1/2 mile from our campground. 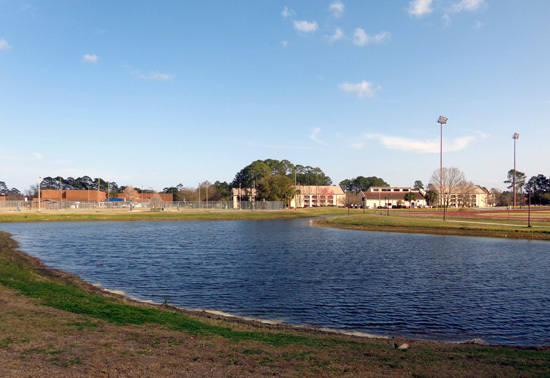 One of many ponds on base; this one is near the track, fitness center, commissary, and NEX. 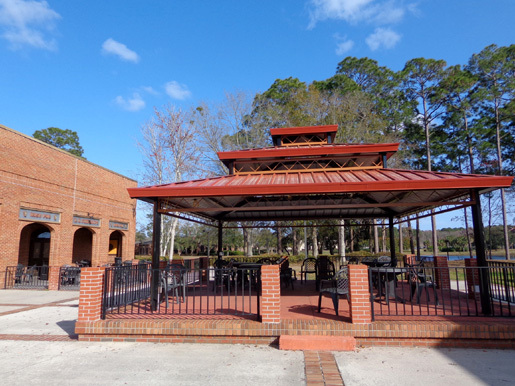 In addition to all the miles that Jim can ride his bike on base, his options for riding off-base are more plentiful and enjoyable at Kings Bay because this is a more rural area than metro Jacksonville. At Kings Bay the active duty housing for couples and families is just outside a gate on the north side of the base. 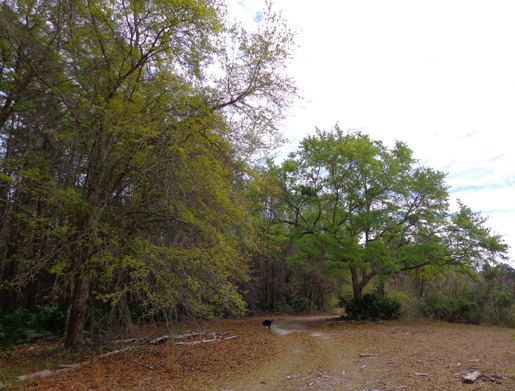 Jim likes to ride through that residential area, past the nearby military golf course, and through Crooked River State Park. He also likes to ride down to the historic little town of St. Marys to get in more miles and have work done at the bike shop there. Most of the photos in this section are ones I took on my bike rides, which have been less frequent and shorter than Jim's. 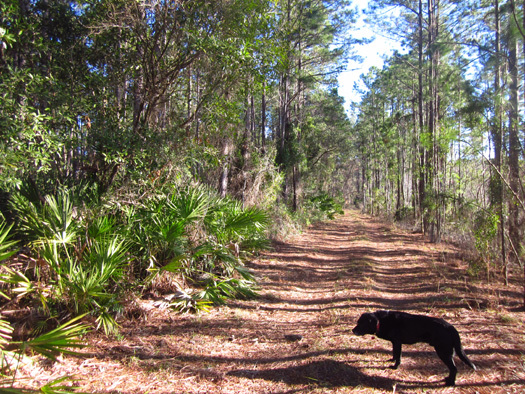 My main sport is hiking, partly because we've got two active Labrador retrievers who need lots of exercise. Because I have weak shoulders and Casey-pup has more energy than she knows what to do with, I have to walk the dogs separately. I spend so much time walking with the dogs that I don't have much energy left to ride my bike. 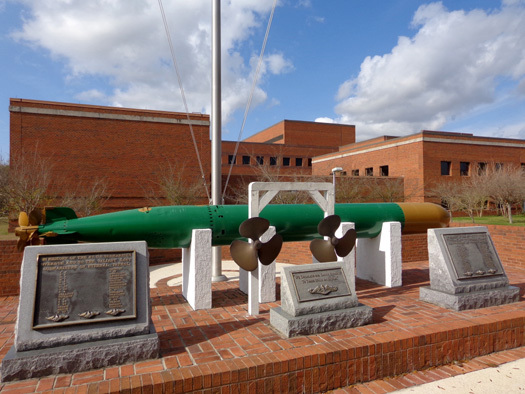 The photo above is a memorial to missing and fallen submariners. As noted, I spend a lot more time walking with the dogs than riding my bike. My favorite place to hike is around the lake that's right out our door. 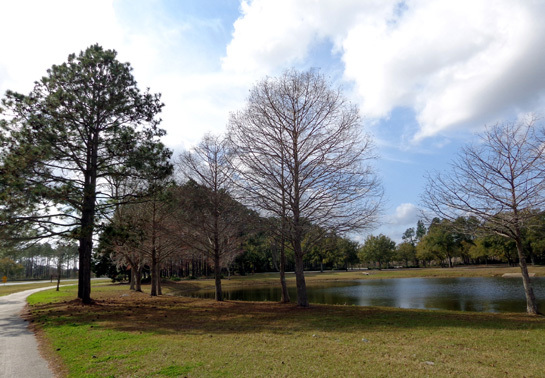 There are several scenic freshwater ponds and lakes in the part of the base where we have free access. I've shown three of them above. 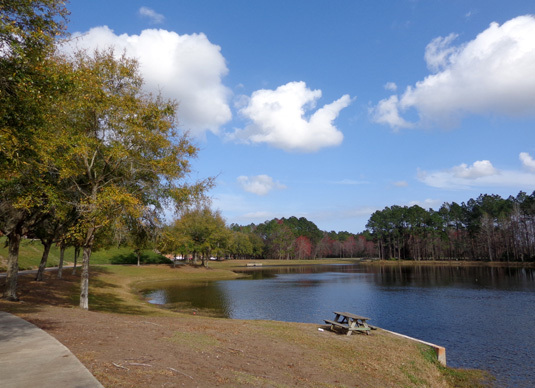 Eagle Hammock RV Park is located at the southwest corner of Lake D, the largest lake in this part of the base. 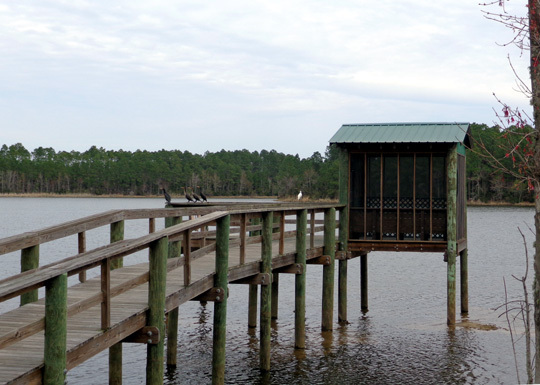 It is centered in the Lake D Recreation Area, which has two fishing piers, two covered shelters, a children's play area, and places for fishermen to put in their boats. With only some cursory research I haven't been able to find out how large Lake D is but it's a good three-mile hike to do a complete circuit with the dogs. Most of my route is as close to shore as I dare take them because of the alligators. 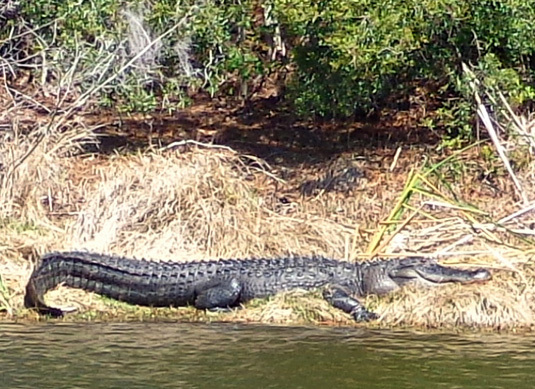 In almost any body of water in Florida and all the southern parts of Georgia, Alabama, Mississippi, Louisiana, and Texas there is the potential for alligators. If I can't clearly see the bottom of the stream or pond in potential alligator territory, I won't let the dogs get in the water. 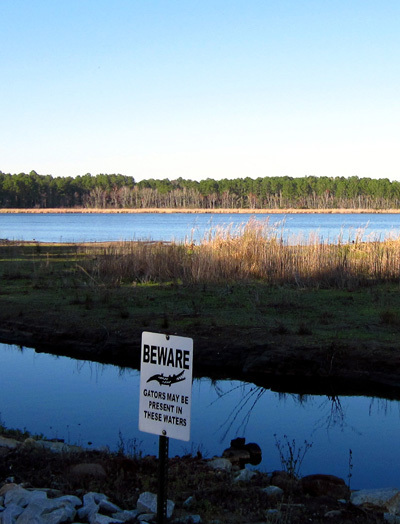 There are signs around Lake D warning people that "alligators may be present in these waters:"
So far the gators haven't been a problem with either Cody or Casey. Casey is still very impulsive at five months of age so she's on the leash most of the time. The problem when she's off-leash is that she'll just run up to people or other dogs if she has the opportunity -- and that's never a good thing. I'll let her run off-leash in more remote areas if I'm pretty sure no one is around. She sticks close to me but is able to investigate things more easily, chase sticks or balls, and do her goofy "devil runs" where she acts like she's possessed. The only place that's relatively safe to let her run off-leash at King's Bay is for about a mile on the far side of the lake (photos above). I've never seen anyone else back there.